BREAD COMES TO LIFE was written, produced and directed by George Levenson whose award-winning films include PUMPKIN CIRCLE (www.pumpkincircle.com) and SADAKO AND THE THOUSAND PAPER CRANES (www.sadako.com). Levenson’s films have been broadcast on television in over 30 countries and are in the collections of every major school district and library in North America. 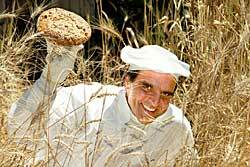 George Levenson also has a long-standing interest in bread; he has been baking it for 30 years and taught the process in workshops to people of all ages. What about those white gloves? The baker in the BREAD COMES TO LIFE video is dressed in baker’s whites -- white chef’s hat, white jacket, white apron, white pants, white socks, and white shoes. He even wears white gloves. 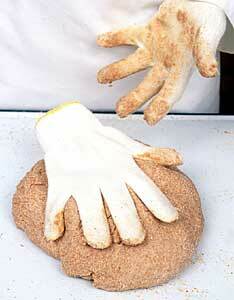 Many people ask: "Do bakers wear white gloves when they make bread?" The answer is a definite " No!" Then how come the baker in BREAD COMES TO LIFE wears them?" Writer/Director George Levenson replies: "I use white clothes in the video to make the character of the baker more universal. He is, I think, dressed in the classic way we imagine a baker to be dressed. The white gloves simply carry the theme a step further. Also, there are many close-up shots of the baker's hands, and I think the gloves keep the viewer focused on the dough and the bread instead of the baker and the color and age of his hands. On another level, the gloves add a sense of play. Because gloves are central to puppetry and mime, they make the baker slightly eccentric and add a touch of whimsy and friendly mystery to the story. A lot of children also ask why they never see more than a glimpse of the baker’s face. Levenson responds: "Same reasons as the gloves." He is "every baker" including the viewer!